The last Skaith book closed with Stark and Ashton finding a ship to take them home. Or so they thought; the captain promptly betrays them, deciding that plundering the entire planet, now that it's in chaos and defenseless, sounds like a better plan. And he's not Skaith's only problem; the sun is old and cooling, and winter arrives extra-early. Half the crops were ruined by war, and now the harvest fails completely. Most of the world population is heading into the warmer areas, but there's no food to eat. The government has nearly collapsed and its last supporters have turned. Stark and Ashton head south through the tropical zone to the antarctic, chasing the pirates and meeting yet more fanatically violent warriors. There is no group in the novel formally identified as "reavers," and I presume she means the betraying, plundering spaceship captain, but honestly it could be practically anybody in the story as a world's entire social order breaks down under the beginning of an ice age. 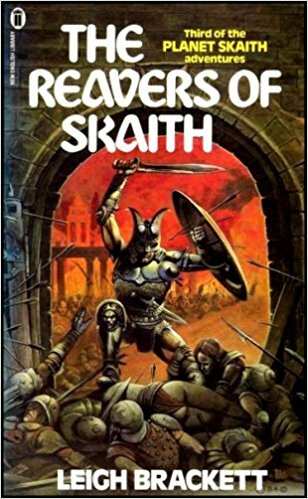 I do wonder if this novel is the first mention of the term "reavers" in science fiction. I poked around a little bit, and the word goes back to Old English from Old Norse. It appears in some of the first Anglo-Saxon documents we have; Alfred used it, it's in Beowulf and in the Bible and more. To reave is to pillage or plunder. It's gained popularity in science fiction -- I'm not very knowledgeable about comics but apparently there were some Marvel reavers in the 1980s, and of course we get really terrifying Reavers in Firefly. 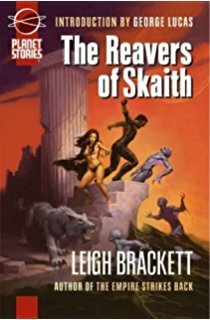 I can't find anything much about reavers before that, though, so I'm going to guess that Leigh Brackett introduced the word into the SF world. Faulkner published The Rievers in 1962 -- same word, different spelling, and not SF.